From simple household repairs such as fixing a leaky tap to installing an AC, get them all done with EasyFix. They are your new bestie when it comes to anything household. We all have that bhaiyya who is Jack of all trades, when it comes to small house repairs. But so often it happens that even our Jack bhaiyya won’t be able to help us out when it comes to fixing the radiator of your fridge or installing a split AC. Enter bhaiyya’s proverbial big brother, EasyFix who will help you out with the home repair and maintenance services. Plumbing, Electrical, Carpentry and Large Appliances (AC and Refrigerators) are what these guys offer the expert services in. If you are looking for a plumber, they have skilled servicemen who can fix anything from a broken flush to remaking an entire bathroom. We all know how cumbersome it is to get faulty wiring fixed. But thankfully these guys are experts in Electrical repairs and fix faulty wirings, install light fixtures, and even rewire an entire wall to sort out any short circuit issues. 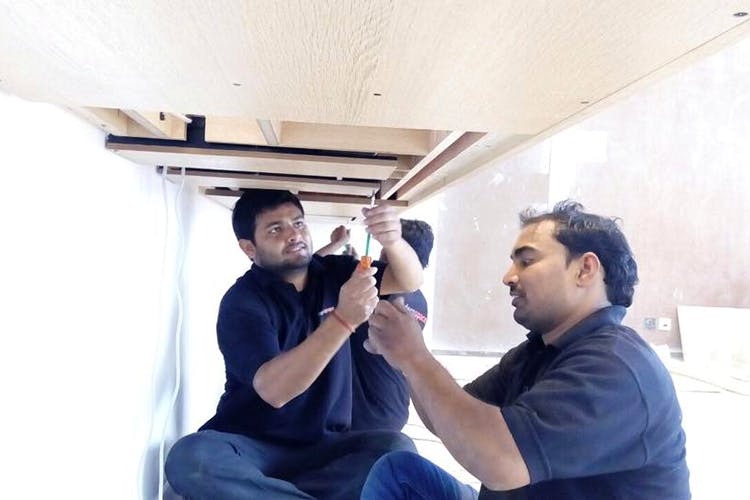 We are really loving their carpentry service that will help you with general carpentry, furniture remodelling, sofa upholstery, and even fix broken furniture. It just makes refurbishing the house easier! We are also considering calling these folks to get our shower head fixed, seeing as it’s been 3 years since it stopped working! The service works on an appointment basis where you can schedule a call back from EasyFix. Depending on your service request, a serviceman is deployed to your location under two hours. You can schedule the visit on your free days or during weekends so that you can supervise and tell the serviceman what repairs need to be done. Every booking request has to be routed through the website wherein, you simply need to enter your phone number and you will get a call back from them. Their minimum consultation charges are INR 250.